Ethiopian officials say scores of people have been injured, some critically, in an explosion at a rally for the new PM Abiy Ahmed. Earlier Mr Abiy had said that several people had died. 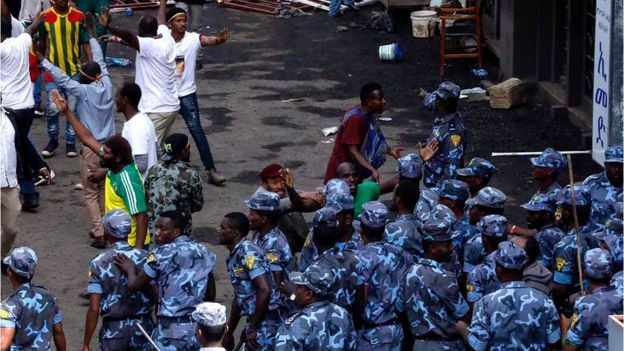 Mr Abiy described it as an "unsuccessful attempt by forces who do not want to see Ethiopia united". He was whisked away immediately after the blast, thought to be from a grenade thrown amid thousands of people in Addis Ababa's Meskel Square. His Chief-of-Staff Fitsum Arega said 83 people had been injured, six critically. Mr Abiy only became prime minister after his predecessor Hailemariam Desalegn unexpectedly resigned in February. 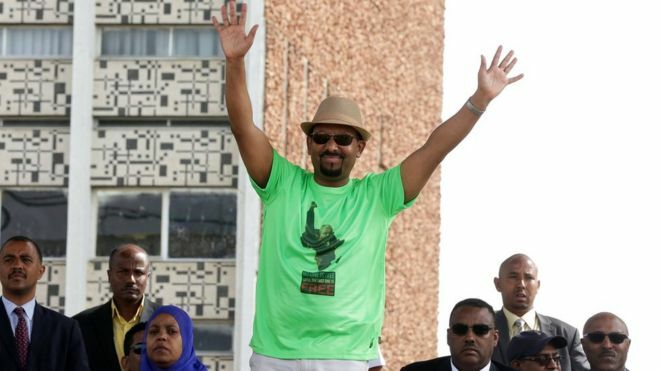 Is this the man to change Ethiopia? He is also the country's first leader from the ethnic Oromo group, which has been at the centre of nearly three years of anti-government protests that have left hundreds of people dead. Since taking office he has begun passing a series of reforms, including unblocking hundreds of websites and TV channels. He has also said he is ready to implement in full a peace deal with Eritrea that was signed in 2000 after a two-year war. Eritrea has condemned the attack on Mr Abiy's rally. 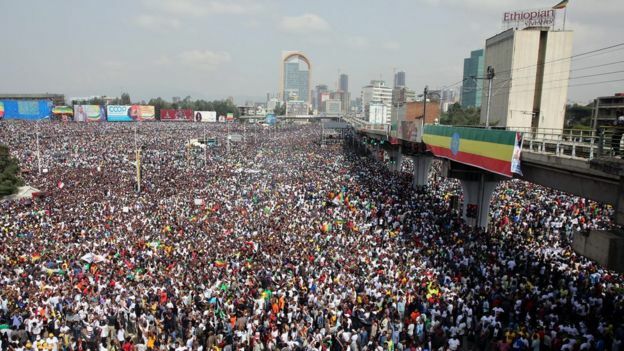 Its ambassador to Japan Estifanos Afeworki said on Twitter the rally had been a "demonstration for peace", which he called the first of its kind "in history of Ethiopia". The US embassy in Addis Ababa also condemned the blast, tweeting: "Violence has no place as Ethiopia pursues meaningful political and economic reforms." On Friday an Ethiopian rebel group suspended its armed resistance against the government. Ginbot 7, based in Eritrea, said Mr Abiy's reforms had given it hope that "genuine democracy" may be "a real possibility". The Ethiopian government has been accused of human rights violations including torture and extrajudicial killing of political dissidents. An ethnic Oromo, Mr Abiy is believed to have huge support among the Oromo youth as well as other ethnic groups. One of the Oromo's main complaints is that they have been politically, economically and culturally marginalised for years, despite being the country's largest group. He is leader of the Oromo People's Democratic Organisation (OPDO), one of the four ethnic parties which make up the ruling Ethiopian People's Revolutionary Democratic Front (EPRDF) coalition. The 42-year-old, who was born in the city of Agaro in Oromia and comes from a mixed Christian-Muslim family, joined the OPDO in the late 1980s. He has served in the military, founded the country's Information Network and Security Agency, which is responsible for cyber-security in a country where the government exercises tight control over the internet, and then became the minister for science and technology.